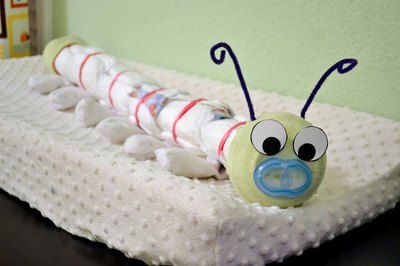 Whether you are decorating a baby shower or brightening up a nursery, a diaper caterpillar is a cute way to display diapers and socks for a newborn. In addition to being a practical creation that provides brand new mothers with a few essential baby supplies, a diaper caterpillar can also be created and personalized for both girls and boys by using different colors. Gather your supplies and make this adorable gift and decoration for the new or expectant mothers in your life. 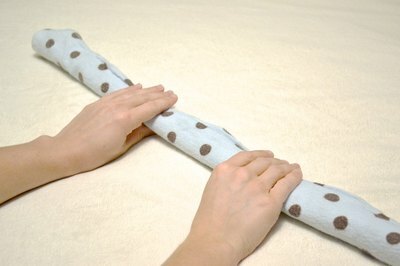 Fold the receiving blanket in half horizontally and roll the blanket into a rope shape. Roll a diaper around one end of the receiving blanket. Place an elastic band around the diaper to hold it in place. Roll another diaper around the first diaper. Tie a piece of ribbon into a bow around the middle of the diapers to hold them in place. Repeat this process along the length of the receiving blanket until the entire blanket is covered with diapers to create the body of the caterpillar. Fill the baby socks with cotton balls to create the feet of the caterpillar. Tape the socks on to the bottom of the caterpillar body with the double-sided tape. Place the 5-inch plastic foam ball in one of the baby beanies to create the head of the caterpillar. Tape the head on to one end of the caterpillar body with the double-sided tape. Cut a hole through the beanie and plastic foam ball with the scissors to create the mouth of the caterpillar. Stick a pacifier through the holes in the beanie and plastic foam. Use the double-sided tape to attach the two large googly eyes to the head of the caterpillar to complete the face. Cut two small holes in the top of the caterpillar head and stick one pipe cleaner through each hole and into the plastic foam ball to create the antennae for the caterpillar. 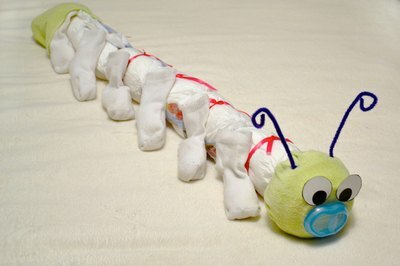 Place the second baby beanie over the back end of the caterpillar body to complete the diaper caterpillar.